Chad had some specific ideas about what he wanted in a surfboard, so I invited him down to the shop, and we collaborated on this neat little hybrid design. For starters, Chad wanted a full-outline design in a short (but not too short) length. He wanted a board with a pretty wide wave-range, but one that he could duck-dive. Working together with the Aku Shaper software, we came up with this functional little, 2+1 diamond tail hybrid. Dims are 6’8″ 14-3/4″ x 21-3/4 x 15-1/2″ 2-5/8″ thick. Bottom has relaxed entry rocker with single-to-double concaves, and a little “V” out the tail. The board can be surfed as a signle-fin, 2+1 or thruster depending upon mood and conditions. Chad chose to start with an 8-1/2″ Frye Flex fin. 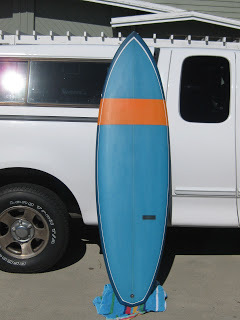 Board was finished with “Mercedes Blue” resin tint, orange resin stripe and white pinline. Sanded gloss-coat for matte finish. Glasswork done by Ray Lucke.